To set the visor in the forward position, flip it down. To set the visor in the side position, flip down, unhook, and swing it to the side. 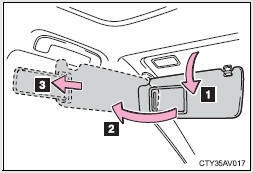 To use the side extender, place the visor in the side position, then slide it backward.